Certainly you've come across this term when following patterns, but what does it mean and how to go about it? Fear not! Today I'm going to demonstrate several methods to finish off your work! Finish off just means to cut the working yarn and finalize our work in such a manner that it won't unravel. Note: If the pattern indicates to "leave a long tail" make sure that you do before cutting the yarn, that tail is going to be used later, probably to attach that piece to another. As you can guess by the name this method just involves cutting the working yarn and pulling it until the end of the yarn becomes loose. This method is simple and quick, and prevents the piece from unraveling, but I feel that the last stitch may become looser and that's why I usually don't use it. Similar to the first but with one additional step. 1. Work your piece as usual until the last stitch. 2. Cut the working yarn and yarn over. 3. Pull the yarn through the loop and pull the loop until the end of the yarn becomes loose. 4. A knot is created that prevents our work from unraveling and the last stitch to loosen. This is the method that I use more often, besides securing the yarn and preventing our work from unraveling it is practically invisible and leaves a smooth edge on our work. 1. I like to make a slip stitch before making the needle join just to bring the height of the last stitch down. 2. Cut the working yarn and pull the loop on the hook until the end of the yarn becomes loose. 3. Thread a tapestry needle with the end of the yarn. 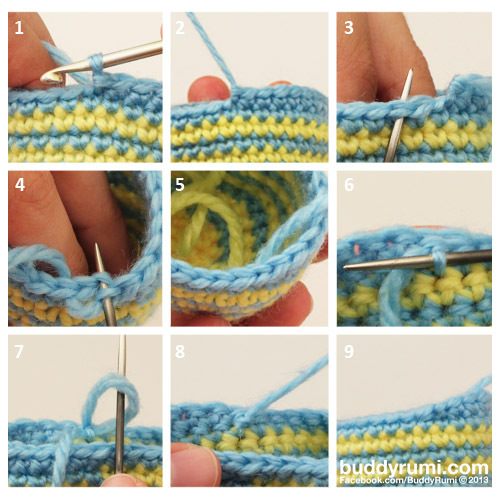 Skip one stitch and insert the needle under the both loops of the next stitch. 4. Insert the needle between the front and back loops of the slip stitch and of the stitch under it. 5. Pull the yarn until it resembles the top of a stitch. Don't pull too tight. 6. Turn work. Insert the needle under a loop on the back of the stitches. 7. Pull yarn until creating a loop and insert the needle into the loop. 8. Pull, creating a knot and securing the yarn. 9. The needle join is complete. As we can see from both pictures 5 and 9 the needle join is almost invisible and the edge of our work remains smooth. This technique can also be used to join rounds when not working in spirals! Now that we know how to finalize our work to prevent it from unraveling, what do we do with the tails? We can't have them hanging around our beautiful work! To know how to get rid of the tails join me on the next How To... where we'll go over several methods to hide the ends of the yarn.